On April 29, 1992, the streets and neighborhoods of Los Angeles, California started to burn just after the Rodney King verdict was announced where four white police officers caught on videotape brutally beating an unarmed black motorist (King) were acquitted of assault by a predominantly white Simi Valley jury. Violent protests, looting and arson lasted several days and left more than 50 people dead. 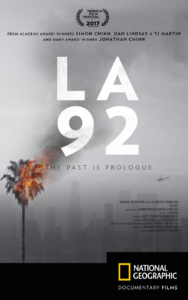 Twenty-five years later, the acclaimed documentary LA 92 from Oscar® winning directors Daniel Lindsay and T.J. Martin (UNDEFEATED) explores the events leading to the violence, as well as the chaos and destruction that happened. LA 92 presents an incredibly immersive and affecting experience of a city in turmoil, without any talking heads or narration, which eerily resembles the same news stories we see on TV today in 2017. The filmmakers spent over a year searching and sifting through over 1700 hours of footage from news reports, journalists’ stories and news archives. Told entirely only through these stunning news reports and images and rarely seen archive footage, this gripping film captures the shock, disappointment and fury felt by many Angelenos, particularly those in the African American community. 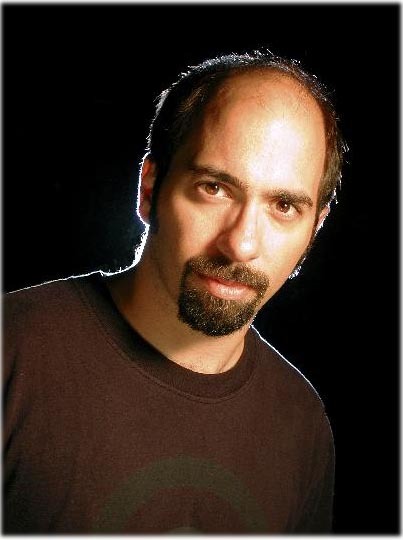 In the case of the King beating, it was the first time the kind of abuse many had witnessed or experienced at the hands of LAPD officers was recorded and broadcast for the world to see, leaving some with the sense that if justice did not prevail despite such graphic evidence, it never would. Named by Variety as one of the best films of 2017, LA 92 is more than a moment in time, it’s an illuminating political, cultural and social experience that elevates our collective understanding of our history and ourselves. Co-directors T.J. Martin and Daniel Lindsay join us. 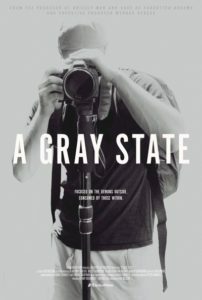 In 2010 David Crowley, an Iraq veteran, aspiring filmmaker and charismatic up-and-coming voice in fringe politics, began production on his film “Gray State.” Set in a dystopian near-future where civil liberties are trampled by an unrestrained federal government, the film’s crowd funded trailer was enthusiastically received by the burgeoning online community of libertarians, Tea Party activists as well as members of the nascent alt-right. In January of 2015, Crowley was found dead with his family in their suburban Minnesota home. 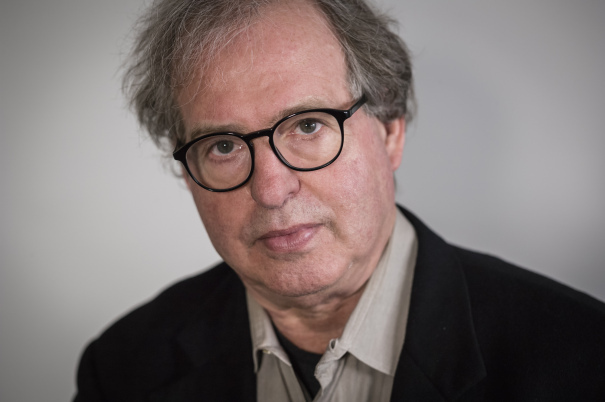 Their shocking deaths quickly become a cause célèbre for conspiracy theorists who speculate that Crowley was assassinated by a shadowy government concerned about a film and filmmaker that was getting too close to the truth about their aims. Directed by “Grizzly Man” producer Erik Nelson and Executive Produced by Werner Herzog, “A Gray State” combs through Crowley’s archive of 13,000 photographs, hundreds of hours of home video, and exhaustive behind-the-scenes footage of David’s work in progress to reveal what happens when a paranoid view of the government turns inward — blurring the lines of what is real and what people want to believe. Director Erik Nelson joins us to talk about his verite-style film and the truth behind the Crowley family’s tragic deaths. In this biting domestic story, Jill, a lonely, unfulfilled housewife with four unruly children, paces on her dining room table with a belt around her neck, contemplating a desperate end. Her husband, Bill, focused on his identity as breadwinner and an affair with a lusty co-worker, is as oblivious to Jill’s growing terror that she will do something destructive as he is to the panic at his unraveling company. Meanwhile, dogs bark and howl through the night, as one persistent mutt continually stalks the family’s yard. When Jill’s psyche finally breaks, she takes on a vicious new canine persona. Marianna Palka writes, directs, and stars as Jill in this dark and provocative film, balancing a whip-smart, deeply unsettling take on the horrors of a crumbling nuclear family with a palpable sensitivity for her character’s plight and perfectly timed comedic flourishes. Jason Ritter delivers a beautifully tragicomic performance as Bill, who’s transformed by bizarre crisis from an indifferent hound of a man entirely untethered from his family to their unexpected emotional anchor. Director and lead actor Marianna Palka joins us in a conversation about her go-for-broke approach to the story and performance. 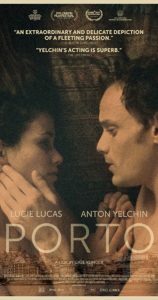 In the haunting, intimate tale PORTO Jake (Anton Yelchin) and Mati (Lucie Lucas) are two expats who experience a brief but intimate connection in the ancient Portuguese city of Porto. He’s an American loner exiled from his family. She’s a student from France embroiled in an affair with one of her professors. After spotting each other from a distance at an archeological site and then again at a train station and a café, Jake works up the courage to approach Mati and they embark on a night of carefree intimacy. This romantic encounter is viewed from years later, both characters still haunted by the powerful connection they shared. Using a mix of film stocks and art direction that evokes a bygone era of European cinema, Porto delivers a cinematic form of saudade – a Portuguese word that describes an emotional state of nostalgic longing for a person or place that one has loved. 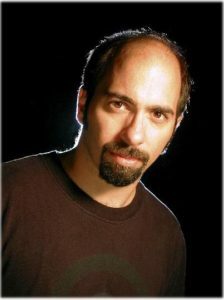 Director, writer, editor, and producer Gabe Klinger stops by to talk about his bittersweet, heartbreaking, soaring ode to romantic love. It’s a story that beggars belief—a bipolar practitioner of “candle magick” living in a dilapidated farmhouse in rural Ohio with a lifelong obsession for building violins (and covered in tattoos of master builders such as Stradivarius) convinces a world-renowned soloist via social media that he is capable of creating a perfect replica of the world’s most valuable violin, Guarneri’s Il Cannone. A quirky look into one man’s DIY enthusiasm and perseverance when facing down a self-created, impossible task, Strad Style is the feel-good doc of 2017. 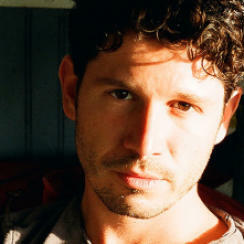 Stefan Avalos is a filmmaker based in Los Angeles. Having started his life as a classically trained violinist and knowing the obsessions that are part of the violin-world, he became intrigued with the story of Daniel Houck, while working on a broader documentary about New vs old violins. 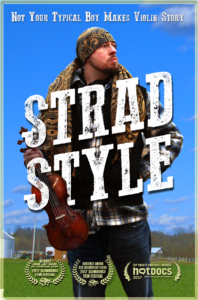 While this movie is still in process, “Strad Style” emerged as a story that became HIS obsession. 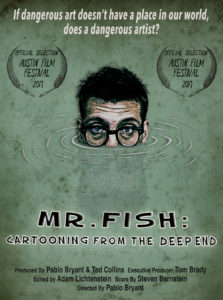 Stefan joins us to talk about the making of this magical documentary. THE LIGHT OF THE MOON is the story of Bonnie, a young and successful Latina architect, sexually assaulted while walking home from an evening out with friends in Brooklyn. At first, she attempts to keep the assault a secret from her long-term boyfriend Matt, but the truth quickly emerges. Bonnie emphatically denies the impact of what has just happened to her. She fights to regain normalcy and control, but returning to her old life is more complicated than expected. Her attempt to recapture the intimacy she previously had with Matt falters and cracks begin to surface in their relationship. Another attack in the neighborhood only drives Bonnie further into denial, before an encounter with an at-risk woman forces her to face the truth and confront her own self-blame. Stephanie Beatriz (Brooklyn Nine-Nine, Short Term 12) gives a powerful and moving performance as Bonnie, a woman who maintains her dignity and sense of humor as she deals with the aftermath of a life-altering experience. 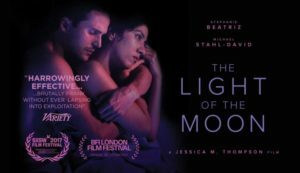 Written and directed by Emmy-nominated Australian filmmaker Jessica M. Thompson in her feature film debut, THE LIGHT OF THE MOON is a powerful reminder of the resilience of the human spirit and the importance of relationships in the face of a tragedy. 11/17 ~ Panel with filmmakers. 11/18 ~ Talkback hosted by Julie Rosing, producer-host of the Lady Parts Justice podcast ReproMadness with LPJ founder Lizz Winstead, co-creator of The Daily Show. 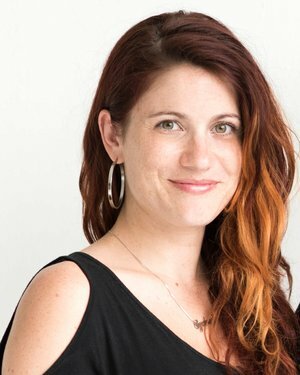 11/19: Seed&Spark/Big Vision screening with talkback hosted by Emily Best, the founder of Seed&Spark, and Amy Rosner, co-director of the upcoming documentary Second Assault. Noël Wells portrays Emily, a talented but hard-to-classify comedic performer who left behind her home and boyfriend to pursue career opportunities in L.A. When a loved one falls ill, Emily rushes back to Austin where she’s forced to stay with her ex-boyfriend (Nick Thune) and his new-and-improved girlfriend (Britt Lower), a totally together woman with a five-year plan. Though Emily is the same, everything else is different: her house has been smartly redecorated, her rocker boyfriend is training to be a real estate agent, and her old haunts show serious signs of gentrification. Holed up in her own guest room, Emily–who has no idea what she’ll be doing five days from now, let alone five years– is forced to question everyone’s values: are they sell-outs or have they just figured out what makes them happy? And is she following her dreams or is she just a self-absorbed loser? Director, writer and producer Noël Wells stops by for a conversation about her funny and touching film about reconciling your past with your present. 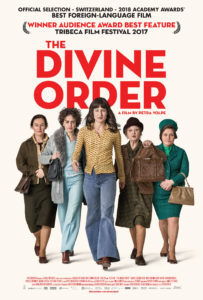 Winner of the Audience Award for Best Narrative Film at the Tribeca Film Festival, The Divine Order is set in Switzerland in 1971 where, despite the worldwide social upheavals of the previous decade, women were still denied the right to vote. When unassuming and dutiful housewife Nora (Marie Leuenberger, winner of a Best Actress award at Tribeca) is forbidden by her husband to take a part-time job, her frustration leads to her becoming the poster child of her town’s suffragette movement. Her newfound celebrity brings humiliation, threats, and the potential end to her marriage, but, refusing to back down, she convinces the women in her village to go on strike…and makes a few startling discoveries about her own liberation. Uplifting and crowd-pleasing, this charming, captivating film is a time-capsule that could not be more timely. Director Petra Volpe joins us to talk about the story behind a struggle for human rights and the women who made Swiss history. 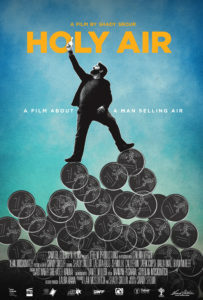 Holy Air is the story of Adam, a Christian Arab living in Nazareth – member of a vanishing minority within a minority in the Holy Land and the Middle East. 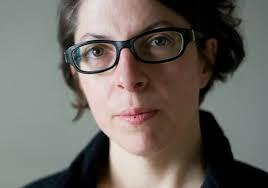 His wife Lamia is a strong, beautiful and progressive Arab woman, who runs a foundation for women’s rights. When Adam hears that Lamia is pregnant and his father falls very ill, he evaluates his life and realizes that he has not achieved much. Despite all his business ideas failing so far, he gives one last try to make it big. And what’s better to sell in the Holy Land other than the very air that Virgin Mary breathed during her annunciation? But in order to, as one priest tells Adam during confession, bring such product into the market he needs to find allies from the three cultures ruling over Nazareth – the Jewish politicians, the Muslim mafia boss and the Catholic church officials. In a politically unstable world where religion is just another merchandise, can the Holy Air be Adam’s salvation or is it just an illusion? Director and writer Shady Srour joins us to talk about his contemporary comedy that not only transcends barriers of religion, gender, and culture, but is also intelligent and funny. WHAT HAUNTS US tells the real story behind the town that remained silent but the outcome was that of suicide by the victims. This film is a cautionary tale for parents and their children and a horrifying example of what happens when one stays quiet about sexual abuse/molestation. WHAT HAUNTS US tells the story about the 1997 class of Porter Gaud High School in Charleston, South Carolina that graduated 49 boys. Within the last 35 years, six of these boys committed suicide. Filmmaker Tolmach graduated from Porter Gaud, and now she digs deep with this film in discovering the dark secrets that have lingered and haunted this community that she so loves. The six boys that committed suicide featured in the film didn’t have to die if they would have spoken out and not remained quiet about what had happened to them. However, the shame associated with this nightmare often weighs more on the victims – only to keep them silent. WHAT HAUNTS US is not a new story, but it is the continuing common tale of sexual abuse, molestation, shame and a community’s silence so that “no one rocks the boat” rings all too true to this day. Until, we as concerned people speak up, these crimes against innocent victims will continue. Director Paige Goldberg Tolmach joins us to talk about an all to familiar tale that haunts the lives of former students of a prestiges prep school. 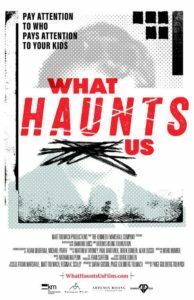 WHAT HAUNTS US will screen at DOC NYC on Monday, 11/13! 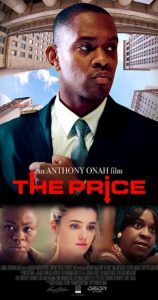 The Price is an intimate immigrant story about Seyi, a bright young Nigerian-American working on Wall Street, navigating complicated family expectations, a turbulent romantic relationship, and a system of cultural complexities caused by class and race. With a dying father, a burgeoning romance with a white girlfriend, and dangerous new business opportunities, Seyi’s life is in a delicate balance. When his ambition drives Seyi to morally dubious waters, secrets threaten to erupt and shatter his world. Seyi must confront himself and decisions he has made, facing the crimes of the past in a desperate attempt to salvage the present. Director, producer, writer Anthony Onah and Producers Krishori Rajan and Justin Begnaud join us to talk about making of this heartfelt tale of family, career and modern love. 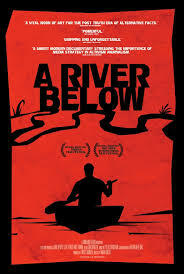 A documentary as dramatic, ambiguous, and multilayered as any fiction film, A RIVER BELOW examines the efforts of two conservationists in the Amazon to bring about change by using the national media, only to discover the consequences of their actions come with a high price. A RIVER BELOW provides an eye-opening look at what happens when passion and opinion trump reason and morality. The crux of the story questions the truth in images, its manipulation to get the public’s attention and, ultimately, who pays the price for someone else’s passion for radical change. 2018 Official Oscar® Entry – FRANCE Best Foreign Language Film BPM tells the story of how a passionate group of Parisian activists goes to battle for those stricken with HIV/AIDS, taking on sluggish government agencies and major pharmaceutical companies in with bold, invasive actions. The organization is ACT UP – the AIDS Coalition to Unleash Power – and its members embrace their task as a literal life-or-death mission. With more than 6,000 new diagnoses made each year in France, there is no time to waste. And yet, the officials and the corporations are not moving fast enough. 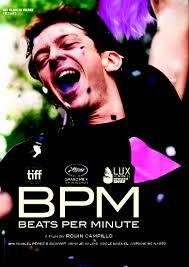 “BPM” tells the story of that fight from the inside-out. Amid the rallies, fierce debates and ecstatic dance parties, intimate connections are made and vibrant life rages against death. As the activists scramble from boisterous street demonstrations and boardroom face-offs to dance floors pulsing with light and rhythm, Nathan and Sean’s relationship deepens. They confess individual memories of sexual initiation that are profoundly tied, in different ways, to the emerging AIDS crisis, and sexual intimacy itself becomes a kind of resistance. As Sean gets sicker, their passion sparks against the shadow of mortality, and the activist community of activists plots its most dramatic protest yet. Director and writer Robin Campillo joins us for a conversation on his intimate and thoughtful tale of activism and struggle in the face of intractable indifference and antipathy.